Adventure Kidz is the ultimate destination for kid’s entertainment in Aylesford, United Kingdom. It is an arena with a soft play area, indoor quad bikes, 6 metre drop slide, football as well as multiple slides, a toddler’s zone and five big party rooms as along with a plethora of entertainment options. The timings and duration of sessions differ as per peak hours, so it is always good to find the current season timings from the website. You can also visit the amazing restaurant with an in house chef who is always ready to serve you amazing delicacies. Create a flawless plan, make use of Aylesford trip planner. Your worry of where to stay in Aylesford is sufficed by bunch of interesting and comfortable lodging options in the Aylesford like Yha Medway, Mercure Maidstone Great Danes Hotel, Holiday Inn Rochester-chatham and Larkfield Priory Hotel. If you want to add the visit to Adventure Kidz in your trip, you can choose from the variety of Aylesford vacation packages that can be designed to suit your preferences. These packages also cover your major concern of how to reach Aylesford. Take a train from Teapot Station or take a cab. Love this? Explore the entire list of places to visit in Aylesford before you plan your trip. Fancy a good night's sleep after a tiring day? Check out where to stay in Aylesford and book an accommodation of your choice. How popular is Adventure Kidz? People normally club together Bodiam Castle and National Trust - Ightham Mote while planning their visit to Adventure Kidz. Great place for any age child. I took my 5 month old who loved the sensory bits. Unlike many soft play places it's clean and you don't feel dirty when you leave. First time my daughter and granddaughter took me to this indoor adventure play area. I would highly recommend...I had a fantastic time..O ...so did my granddaughter. You have all the facilities available including a reasonably priced snack bar.. highly recommend the jacket with chilli.. I would recommend you get in early if possible parking can be a bit tight. Worth every penny. My kids love it here. The toddler area is reasonably large unlike most soft play areas, where it is just an after thought. They also have a drop slide and high wire activities for the older ones. The food and drink is of a good standard too, so even the adults are kept happy. 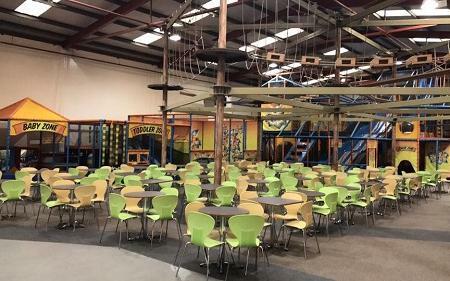 Great soft play for kids of all ages, large toddler area, large area for older kids as well as a "go-ape" type area all included in entry price. It's not cheap but it's good value for money with everything that is included. Cafe is also reasonably priced and not overpriced like other places. Highly recommend. My son was a bit old for it really (11) but went for the high ropes and drop slide and enjoyed those. Beware you can't wear nylon on the drop slide!